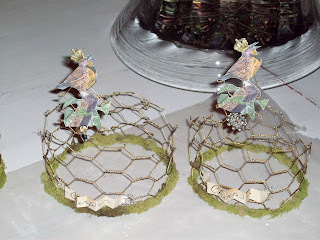 Chicken Wire Can Be Pretty!! Sorry if I didn't visit all of you yesterday. I was up to my elbows in chicken wire. 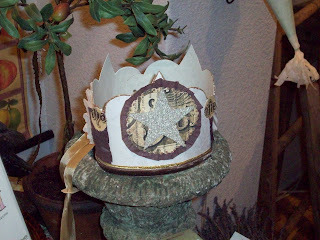 I started making these crowns for garden statues, indoors or out. 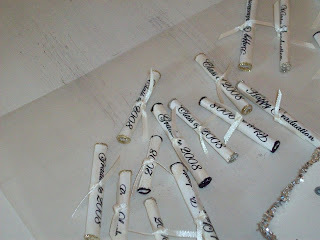 They turned out so cute, my friend Jamie said I should put them on my blog for you to see!! So here they are. 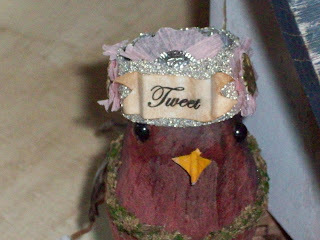 If you are wondering, I used moss around the bottom of the crown, and the cute bird graphic came from The Graphic Fairy. I embellished of course. The hardest part is cutting and bending the wire. 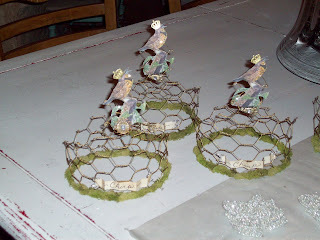 Chicken wire can be poky, and you can't really wear gloves while working with the wire. Each one turns out slightly different, hence the hand done thing. (What, I'm not a machine)? This project took up my entire day yesterday, but it's quite nice when a project turns out well. 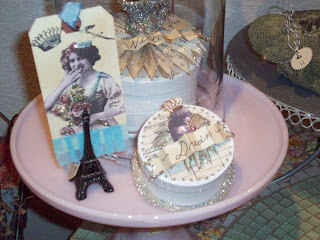 New Blog Look, and More!! We are having extremely warm weather for this date!! It's fooling us into thinking it's summer!! 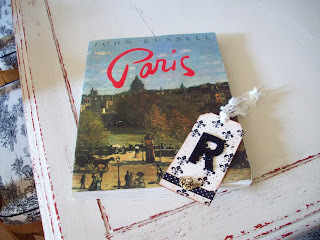 I was pleasantly surprised the other day, with an unexpected package from Dolly, at http://frommycherryheart.blogspot.com/ She saw this book in an antique store, and apparently thought of me. She sent it to me along with this really cute tag that she made. Now how sweet is that? I'm telling you bloggers are amazing people!! Thank you Dolly!! I can't wait to dive into this book!! I'm sure you have noticed the new look on my blog. Well, let me tell you about it. First of all I know nothing about creating with the computer. I can do artwork all day long, but when it comes to computer stuff, not good! Talking about how nice bloggers are, Ashley Draper, http://thedraperhouse.blogspot.com/ decided I needed a prettier blog, so she took it upon herself to do this for me, along with some help from her friend Amber, at http://theshabeechick.blogspot.com/. Isn't that the nicest thing? Ashley and Amber are both web/graphic design girls. They are amazing!! Thank you so much girls!! I love the new look!! Now, yesterday I was in search of a rose bush called Cecil Bruner. The name given to me by my friend Barbara. She had some of these tiny pink roses on the counter at her shop. I fell in love with them immediately. So of course I had to go and find them. Well the usual nursery that has everything, didn't have it. They assured me they could order it, and I would get it next week. Yay!! Meanwhile, I had to check at the other nursery across town to see if they had one. 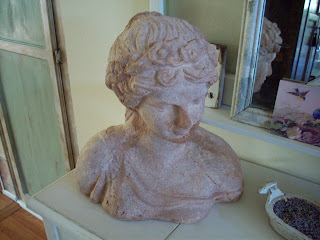 They did not, but they had this beautiful bust. It was love at first sight. I have been wanting something like this for awhile. Well I just had to have her. I thought she would be the perfect model for my crowns!! Anyway I think she is great!! I can't wait to make a crown for her. You see, I don't have any of my crowns. They always seem to leave my house for other homes too fast!! (That's a good thing though) Have a great day, and I promise to get around to visiting your blogs as soon as the glitter and glue dries on my latest project. 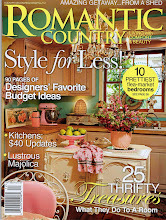 Thanks again to the kind people out there in blogland!! Flea Market Find, and the Tiniest Crown! 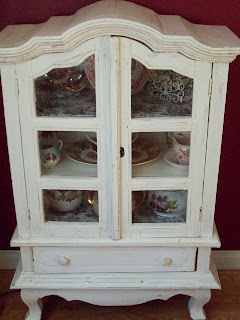 Blogger is cooperating today, so here are some pictures of the cute little hutch/cabinet I got at the Ventura Flea Market this past Sunday. I love the details, and it has glass on 3 sides. I think it was a bargain at $60!! I didn't have to do too much to it, except clean it up. I started adding a few of my pieces. Girls must play!!! I love the little drawer too! 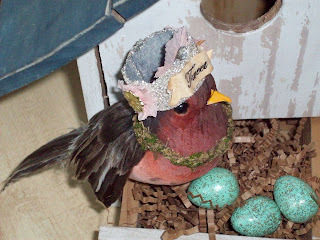 In my last post I had made a crown for robin, the bird. Now I went a little crazy and made the tiniest one to date. I thought my little mouse needed a crown too. 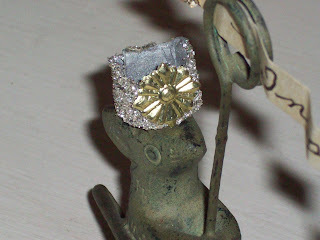 Rockin Robin and Old Rhinestones!! I have been trying to upload some pictures of me flea market hutch, but I think blogger is having a bit of a problem today. I got as far as this. I bought this robin at the beginning of Spring, from Garden Memories. Yesterday I decided Robin needed a crown of her own. She looks much happier. 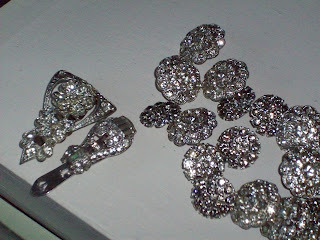 Here are some vintage rhinestone buttons, and clips I got on Sunday at the Ventura Flea Market. 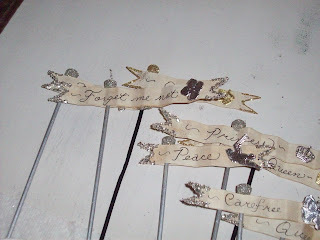 I thought these might be nice incorporated into some crowns. 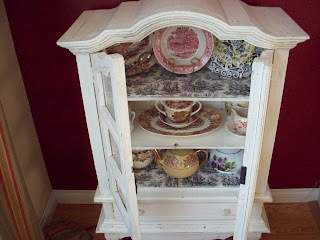 I can't wait to show you my cute little hutch, but I guess it will have to wait until blogger is fixed. So have a great day!! Happy Earth Day!! It was one year ago that I started my blog!! I am so glad to have met all of you, and I am meeting more of you everyday. Jill has a wonderful blog, you should visit her soon. Here is my husband Mark's arm. He always helps with my giveaways. Thank you all for entering!! I appreciate all of you visiting my blog, and for all of the nice comments you leave for me. I enjoy reading each and every comment. Keep it up!! We went to the Ventura flea market today. 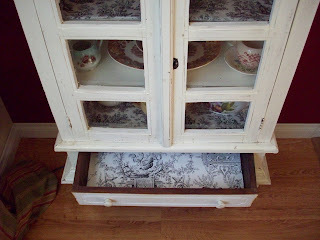 I got a pretty little hutch. I will show you in a future post. I also bought some pretty linen pillows from Jennifer Grey. www.theoldpaintedcottage.com/ It was a lovely day at the beach. 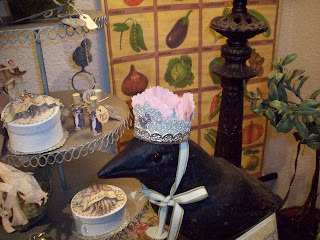 I thought Barbara's raven needed a crown, so I made one for her. She looks so much happier. She is guarding a few of my boxes. 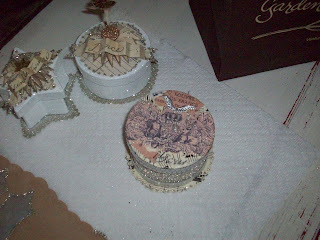 Here is another little vignette. Have a great day, and a wonderful week!! As promised on the previous post, I said I would show you what I found for you at Garden Memories. Here is your prize! Fairy Dust bath salts, pretty little nest, beautiful soft birds, and nest towel, 3 little heart tokens, and some heart French soaps. If you have not entered the giveaway, please do. I will draw a name on Sunday April 20TH. 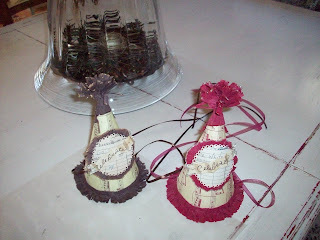 That is the actual Blog Anniversary!! So celebrate, and enter the drawing with a comment!!! Busy, and 1 Year of Blogging!! 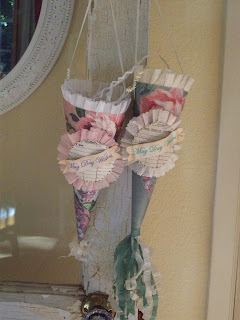 I have been busy making things for May Day, and graduations this week. 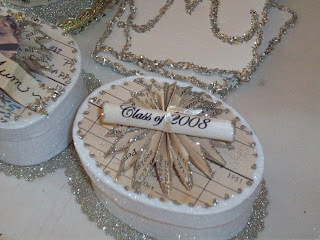 I made the tiniest diplomas, and dipped them in what else, glitter!! My 1 year of blogging is coming up a week from today on April 20TH. I want to have a nice giveaway for you. 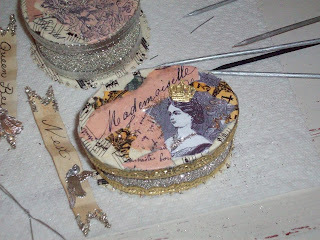 Here is my little dilemma, since I have another busy week ahead of filling an order, I won't be making a handmade item. 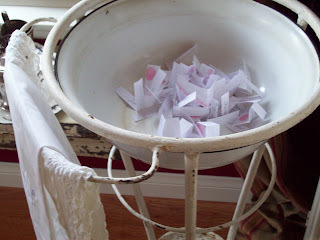 I am going to pick out a pretty prize today at Garden Memories. 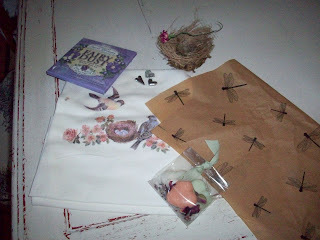 You will love receiving something from Barbara's shop!! I promise to have another giveaway sometime when I am not as busy, and I will be able to make a prize. 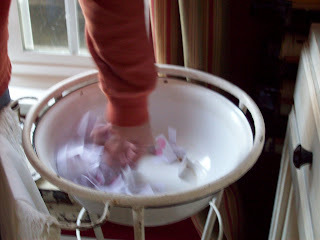 If you want to enter, just leave me a comment between now and April 20Th, and I will enter your name. Please leave a blog, and or email where you can be contacted. I will post a picture of your prize later this week. I have to say, that when I started blogging one year ago, I didn't really even know what a blog was. I have made so many wonderful friends over this year. It has been so great!!! I feel like we all know each other, and share in our daily goings on. You all helped me get through the stress of my daughter's wedding, and just my day to day happenings. 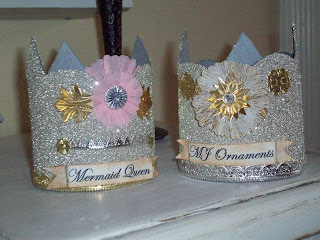 I wanted to show you two glittery crowns that are on their way to Martha. 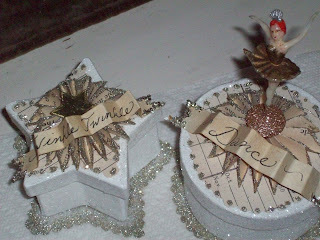 If you haven't visited Martha's blog, it's MJ Ornaments. http://mjornaments.blogspot.com/ AKA Mermaid Queen. 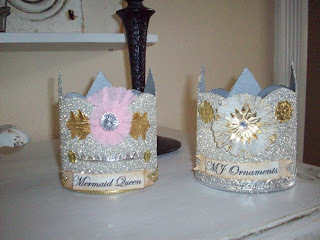 She asked me to make some glittery crowns for her dress forms to wear. She takes them to her craft shows. Martha makes the most beautiful charms. I have some, and let me tell you, she is a master at creating and soldering. I am getting ready to go for my walk, but I just wanted to stop in and say hi. I believe this is my 150Th post. 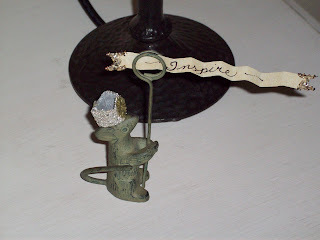 I will be having a giveaway soon, because not only is it my 150Th post, but my 1 year blogaversary is on April 20. I am thinking about what to giveaway. I want it to be fun!! I will keep you posted. I think I am going to combine the two, I will let you know next week sometime what I will be doing. The closest things to dolls that I have to share are, my antique dress form Isabella Crane, and a small collection of Chatty Cathy shoes. Donna assures me that anything relating to dolls, doll parts etc. qualify. So this is my show and tell for the day. I'm sure you have seen Isabella before on several posts. 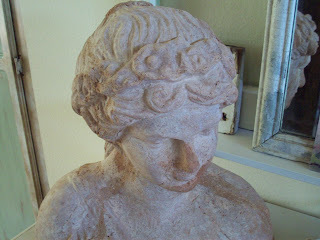 She keeps me company in my office/studio, while I work on my many art projects. I have to blame, well blame is too harsh of a word, Andrea from 100 wishes, ever since I saw a Chatty Cathy shoe on her blog, I have started a small collection. I think the velvet with the flowers on the shoes are adorable. I love the colors. 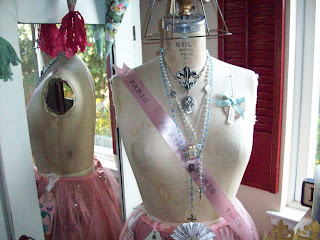 So that is my little tribute to dolls today. I have to go and get busy with my glitter, and glue now. Just wanted to check in, and say hi. 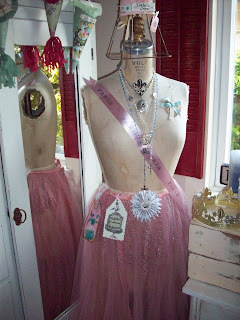 If you have anything doll related, go and visit Lori. My 1 year blogaversary is coming up later this month, so lookout for a giveaway soon. Just playing with glitter again. Thought you might like to see the latest. 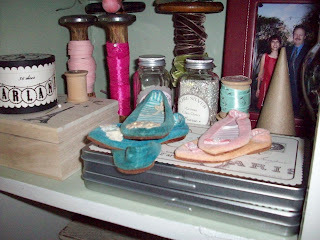 These vintage ballerinas seem to be popular. I remember them on my birthday cake, when I was a girl. Too bad I didn't save mine. The star boxes are popular as well. I think we all love the stars. I hope you are all having a lovely Spring day. It stopped raining here, and now the sun is shining bright.